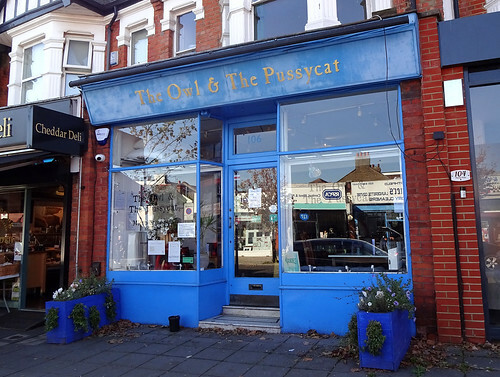 This week's featured article is the charmingly named The Owl and the Pussycat, a micropub housed in a former children's bookshop. It's kept some of the original occupants' vibe with owl and pussycat tat, and lots of bookshelves, one containing a Ladybird book entitled "Peter and Jane Get Cihhorisis". Okay not really. It does offer real ale and a friendly atmosphere with informative and helpful staff. A new page has been added for the recently opened Vue Bromley, although we haven't visited yet. Battersea Park drinkers take note: The Duchess is dead, long live the Duchess Belle. There has been a change of management since we've last visited, so maybe drop by and let us know how it measures up against 2009's experience. The Windsor Castle on Lower Clapton Road, Hackney. The New Rose on Essex Road in Islington. The Flying Pig in East Dulwich. The Angel, a Fuller's pub in Hayes. The Paddington Packet Boat, another Fuller's pub, in Cowley. If you don't have an account you can create one now. HTML doesn't work in the subject. Links will be displayed as unclickable URLs to help prevent spam.